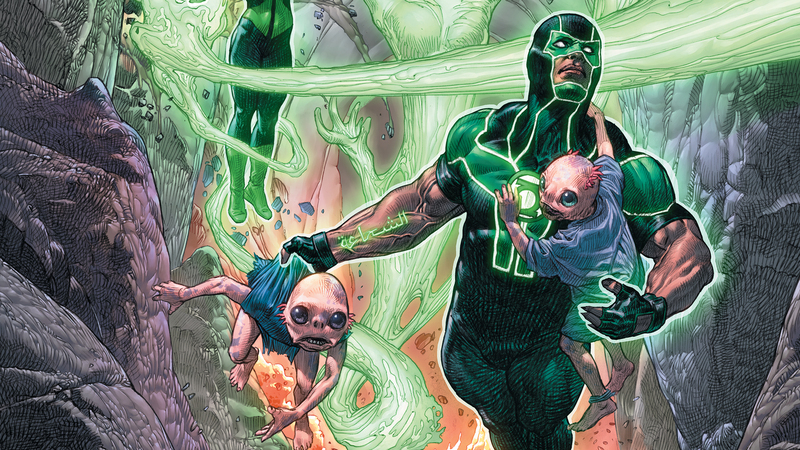 The Sam Humphries era of Green Lanterns is over, and now veteran comic book pro steps into the Green Lantern mythos. Whenever a new creator takes over a book I always feel giddy inside at the prospect of new adventures for beloved characters. Let’s see how Tim Seeley did on his first issue of Green Lanterns. Warning they’re will be spoilers going forward. Be sure to read your comics prior to reading this review. You have been warned. One of the tougher aspects of new writer coming onto newly established books is keeping the current fan base happy to a degree. You don’t want to alienate fans who have been reading since the start, but a new writer wants to establish their identity in some fashion. After I put this issue down Seeley seems to want to keep the same tone that Humphries had, but makes their universe much larger. Tim Seeley makes Simon and Jessica’s personality shine through no matter the situation, in costume, out of costume or even trying to find a job. Seeley makes character come first and that’s how you engage readers new and old. Even though I’ve been reading this series since the start I absolutely loved how Seeley structured this comic. I’m speaking mainly of the flashback sequences that show both Green Lanterns try to adjust to normalcy despite the crazy life that they live. These scenes are great for new readers as it catches them up with their past without lingering to long on the subject, but it also shows both of them attempting to move forward despite their own personal setbacks. Veteran readers are given the satisfaction of seeing the characters they’ve been reading about naturally progress and new readers are given a reason to care about their journey going forward. Thankfully Eduardo Pansica’s art continues to grace my eyes and his art for this issue was amazing as always. What I found the most interesting about his art was during the sequences when both lanterns were out of costume. That isn’t to say the scenes when both Simon and Jessica attempt to save a race of mole aliens from certain doom were not grate I couldn’t but notice the humanity put into the Earth based pages. Seeing Jessica talking to her therapist about her improvements and how she’s unsettled by that notion can all be seen by Pansica’s storytelling. Even further on when she’s being interviewed to be a waitress and one panel sums up her expression and it’s all in her facial expression. Yes storytelling is critical to making a good comic book, I also couldn’t help but notice how bombastic the action sequences were and also the amount of detail on each page. It’s not super detailed but the detail that is there makes the world feel real and believable despite the fantastic settings. Pansica is quickly becoming a great artist and more people need to recognize that. Tim Seeley’s first issue continues the fun and excitement that this series is known for. I do have to mention the lettering error when Simon was being interviewed for his job, because the way the word balloon flowed it seemed that Simon stopped talking and Simon’s potential employee was talking about their rap sheet. Despite the good intentions of the scene, having to read that particular part twice ruined the pacing in a critical moment for Simon’s personal life. Otherwise Seeley delivered a great first issue.